Maxim Sokolov began his presentation with an explanation about what a strategy is. As to him, strategy is a challenge. The leader and the team need to find a response to this challenge, setting themselves not just a task, but a super goal that would be several steps ahead of today's plans. A successful strategy is a set of solutions that allows a company to find and develop unique opportunities and achieve success, basing on such a super goal and on analysis of the current situation. According to Maxim Sokolov, the first step in developing a strategic document should be formulating company's mission statement. It helps to determine the main landmarks. For its development it is important to answer two questions: where and whom the organization wants to be in 3-5 years (or another term of strategic planning). A successful strategy is more than just a mission, but it should not become an action plan. A common mistake is to overspecify, so you need to find a golden mean. The final document should be clear, easy to read, and include no more than 100 pages. The development of a strategic document according to the experience of Maxim Sokolov takes at least 9 months. Its approval may take even longer. “Just as a healthy person cannot be born in, say, six months, so a good strategy development takes time,” he explained. According to him, external specialists should be involved in the development: both well-known companies with famous brands and people with expertise in making strategic documents in the industry can become consultants. Involving an external consultant can give a significant breakthrough. But it is very important to find a consultant whom the organization can trust. Though a competent external specialist cannot become the main key to success. One of the most important factors in developing an effective strategy is team involvement. All levels of management should be involved in this work: “the creation of a strategy is necessarily a team process. Yes, a manager is responsible for everything and the final decision is in his/her hands. But the more managers will be integrated into the formation of strategic proposals, the more successful will be the implementation of this strategy, and the more accurately the “true north” will be defined, ”explained Maxim Sokolov. In his opinion, only if such an approach is observed, the strategy is perceived as a document created by the company. In order the product to be complete, it is important that each level of management use the basis that was developed at the previous level. The implementation of the strategy is a separate challenge for an organization. The strategy must be flexible enough for the company to respond to changes in the external environment. This is possible only if you put in a document the criteria for evaluating the results and fixed points at which measurements will be made. The external perspective, according to Maxim, is also needed at the implementation stage - the project office can help monitor the market situation and, depending on it, if necessary, promptly adjust the strategy. Inside the organization, it is important to ensure that each employee is aware of their contribution to the implementation of the company's mission and strategy. Maxim Y. Sokolov — Acting State Counselor of the Russian Federation, Grade 2, Minister of Transport of the Russian Federation (2012 —2018), General Director of PJSC LSR Group, Ph.D, head of the GSOM SPbU public administration department. 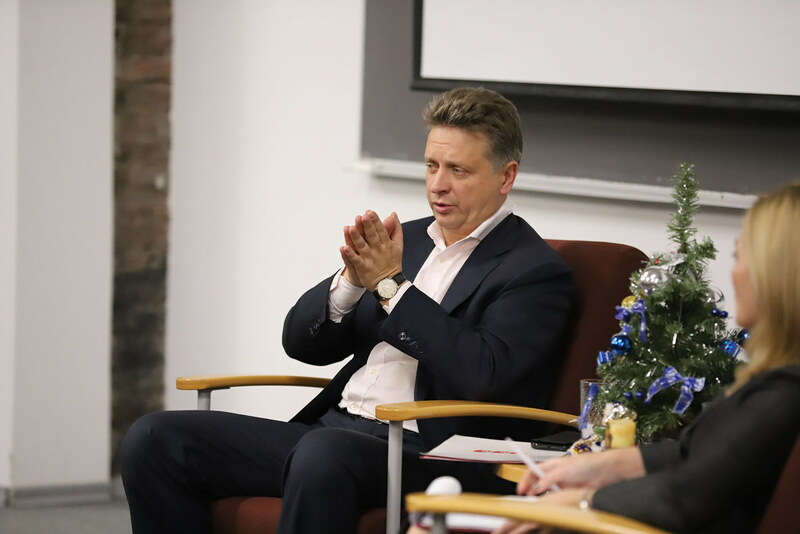 In a private meeting, he met with students of the Executive MBA program of Graduate School of Management at St. Petersburg State University and the MBA: The Challenges of the Digital World.